To evaluate the role of ROSA (Robotized Stereotactic Assistant) navigated intracranial electrode implantation on precise epileptogenic zone localization, 40 patients with drug-resistant epilepsy between March 2012 and September 2013 underwent the procedure. Demographics, noninvasive clinical data, complications and seizure-control outcome after resection were retrospectively collected and analyzed. Of the 40 patients surveyed, 29 underwent unilateral implantation, 11 underwent bilateral implantation. 1 patient experienced an intracranial hematoma caused by the implantation, while the remaining patients underwent the prolonged video-EEG (VEEG) monitoring with no complications. Electrodes were preserved, on average, for 11.4 days ( range 4-34 days); Observed clinical seizures, on average, were 9.9 times per patient (range 2-38 times); There were no cerebrospinal fluid leak, Intracranial hematoma, electrodes fracture or patient death, except 1 patient scalp infection (2.6%, scalp infection rate); 37 patients’ seizure onset area was precisely localized; 32 patients underwent stereo-electroencephalography or coagulation (SEEG)-guide resection or coagulation and were followed up for more than 6 months. There are two main goals of the presurgical investigations of refractory epilepsy: firstly, to localize epileptogenic zone (EZ); secondly, to discover the relationship between the EZ and functional zone (in hemispherectomy, the function of the contralateral hemicerebrum should be investigated). To achieve these goals, two kinds of presurgical investigations, noninvasive and invasive monitoring may be indicated. Noninvasive presurgical investigations include analysis of seizure semiology, prolonged V-EEG, magnetic resonance imaging (MRI), magnetoencephalography (MEG), positron emission tomography (PET), single photon emission computed tomography (SPECT) and neuropsychological test . When noninvasive presurgical investigations are insufficient to identify the location of EZ and the relation between EZ and functional zone, invasive presurgical investigations should be available. The predominant invasive presurgical investigation is intracranial electroencephalography. Subdural grids and strips electrodes are extensively used in many epilepsy centers in China, which can record the epileptic discharge of cortex and define functional zone; however, they cannot record the discharge and the discharge conduction from relatively deep epileptic foci under cortex. In addition, the implantation of the subdural electrodes is by craniotomy in most cases, which is extremely invasive and injurious, especially to the patients requiring bilateral implantation. Currently, stereo-electroencephalography (SEEG) with minor-invasive method becomes a routine invasive presurgical investigation. ROSA is a stereotactic system without frames, developed in France in 2009. Our center imported ROSA in March 2009 and began frameless stereotactic electrodes surgery since then. 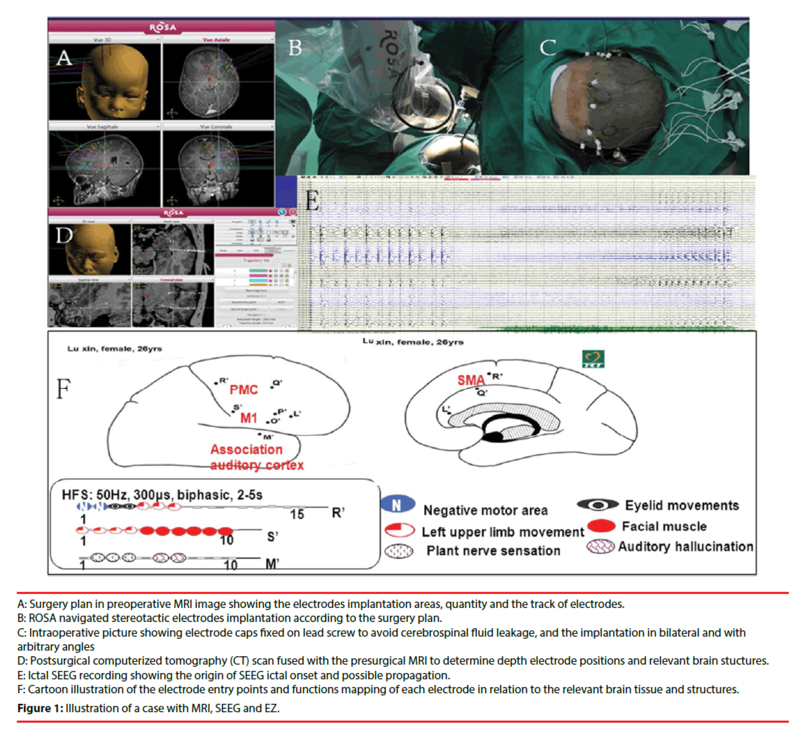 This article retrospectively studies the 40 patients with drug-resistant epilepsy between March 2012 and Sep. 2013 who underwent ROSA navigated implantation of intracranial electrode for localizing epileptogenic zone; here we analyze the role of ROSA navigated intracranial electrode implantation on precise EZ localization with patients’ seizure outcome after ROSA-navigated SEEG-guided resections. 40 patients were diagnosed with EZ epilepsy and underwent ROSA Navigated Intracranial Electrode Implantation at Sanbo Epilepsy Center. The mean age was 19 years (range 4-38 years); 26 of patients were male and 14 female. Most of them had a long epilepsy history with the mean time of 12 years (range 2-27 years). All of the patients took MRI\ CT scans and longterm scalp V-EEG monitoring; some patients took Magnetoencephalography (MEG) and/ or positron emission tomography (PET). The patients had been diagnosed with EZ epilepsy before the application of intracranial electrode implantation. 39 patients completed both ROSA navigated implantation of intracranial electrode and long-term intracranial electrode SEEG, and 1 patients stopped the implantation due to the intracranial hematoma during the implantation. 32 patients underwent EZ resection according to the analysis results of the invasive investigation, with a minimum follow-up of 6-months following resection (Table 1). Table 1: General Demographic of the 40 EZ Epilepsy Patients. Classified the seizure types and specific epilepsy syndrome affecting the patient according to standard of International League Against Epilepsy (ILAE). Presurgical evaluation in Beijing Sanbo Hospital included magnetic resonance imaging (spin-echo T1-weighted axial and T2-weighted axial, coronal sequences and fluid-attenuated inversion recovery images with 5-mm-thick axial, sagittal, coronal sections), scalp video-electroencephalography (32-64 guide), intracranial electroencephalography monitoring (international 10-20 system EEG placement method), seizure semiology analysis, as well as neuropsychologic tests. In addition, some of the patients underwent positron emission tomography (PET), and/or MEG as well as Wada test (for left-handed patients). All the patients had no change in baseline antiepileptic drugs (AEDs). The following are the standards that may require for all intracranial electrode implantation: 1) focal epilepsy; 2) the location of EZ is not clear; 3) the dissection relationship between EZ and functional cortex is not clear. In addition, the application standards for stereotactic intracranial electrode implantation should be applied with one of the following standards: 1) the possibility of a deep-seated or difficult-to-cover location of the EZ with subdural electrodes in areas such as posterior orbitofrontal cortex, gyrus cinguli, interhemispheric regions, depths of sulci; 2) failed surgery history (including previous failure of epilepsy surgery or failure of a previous subdural invasive study to clearly outline the exact location of the seizure onset zone. ); 3) necessity for bilateral monitoring; 4) MRI negative. Our center applies ROSA for the stereotactic intracranial electrode implantation. According to the result of noninvasive investigation, we initially made a reasonable hypothesis of EZ and delimit the possible area of EZ. The hypothetic identified area and the functional cortex area around are the scope for the implantation. After the hypothesis formulated, an implantation plan was required to confirm or reject the preimplantation hypothesis. Double TI enhancement MRI is performed, and the surgical plan is based on the data of the MRI. The design included the coverage of electrodes, quantity of electrodes, the target spot of electrodes and the track of electrodes. In most cases, the area of the implantation is the abnormal region (if present) from the result of image investigation, the more likely structure(s) of ictal onset, and the possible pathway(s) of propagation of seizures within a functional network. The angle of the implantation can be vertical or arbitrary angle with sagittal position (Figure 1). A: Surgery plan in preoperative MRI image showing the electrodes implantation areas, quantity and the track of electrodes. B: ROSA navigated stereotactic electrodes implantation according to the surgery plan. D: Postsurgical computerized tomography (CT) scan fused with the presurgical MRI to determine depth electrode positions and relevant brain stuctures. E: Ictal SEEG recording showing the origin of SEEG ictal onset and possible propagation. F: Cartoon illustration of the electrode entry points and functions mapping of each electrode in relation to the relevant brain tissue and structures. Figure 1: Illustration of a case with MRI, SEEG and EZ. We applied different surgical methods according to the results of monitoring. Patients who were not the suitable candidates for resection surgery treatment will receive neuromodulation surgery. Surgery methods in our center include EZ resection, bilateral deep nucleus electrical stimulation, EZ Bipolar coagulation and VNS. We did patient follow-up within a fixed period. The first review happened in three months after surgery and no adjustment of drugs occurred before the first review. The principle of adjustment of drugs is to gradually taper the dosage to the seizure-free patients; there shall remain one kind of drugs before complete withdrawal. As to the seizure-control patients, the adjustment of drugs was performed according to the specific situation of seizure. The follow-up visit in this study is more than 6 months. The outcome of surgery is classified according to Engel standard. Statistical analyses the outcome of localized surgery and compares the outcome quantity of Engel I and II with EngelIII and IV with t test in SPSS 17.0. P<0.05 was used as the threshold for statistical significance. All of the 40 patients were diagnosed with refractory epilepsy according to the noninvasive investigation, and underwent ROSA-navigated stereotactic intracranial electrode implantation surgery. Among the 40 patients, there were 4 patients (10%) with negative MRI results and 36 pts (90%) with positive MRI results. 6 patients had surgical history, among which 5 patients received EZ resection and the results of the resections were not effective, 1 patient had taken craniocerebral trauma surgery. 29 patients underwent unilateral electrodes implantation (left 15, right 14), and 11 patients underwent bilateral electrodes implantation (Figure 1). Intracranial hematoma happened in 1 patient during the surgery procedure, and the implantation was stopped and postponed to another time. 39 patients completed the implantation surgery smoothly and underwent V-EEG monitoring. Mean staying period of intracranial electrode was 11.4 days (range 4-34 days); Mean seizure times were 9.9 (range 2-38), except the 5 patients with too high seizure frequency. Scalp infection happened in 1 patient (infection rate 2.6%, 1/39). No cerebrospinal fluid leakage, electrode damage or death occurred in the present study (Table 2). Table 2: Implantation of the 40 Patients. Among the 39 patients who completed the implantation and V-EEG monitoring, there were 34 patients with unilateral EZ (31 underwent EZ resections, 1 underwent insula bipolar coagulation and 2 would have EZ resections in another day), 3 patients with bilateral EZ (1 underwent bilateral hippocampal stimulation, 1 underwent VNS and 1adjusted antiepileptic drugs) and 2 patients with a monitor result of unclear EZ (1 did not catch seizure, 1 with diffuse discharge underwent cortex bipolar coagulation). The localizations of 31 EZ resections were topectomy 13, temporal lobe 10, insular lobe 2, lobus parietalis 2, central zone 1 and multiple lobes 3 respectively. The followup visit results of 32 patiens who underwent EZ surgery (31 underwent EZ resections and 1 underwent insula bipolar coagulation) are as follows: EngeL-I 27, EngeL-II 2, EngeL-III 1 and EngeL-IV 2 (Table 3). Table 3: The Details of Implantation and Posttreatment of the 39 Patients. Invasive intracranial monitoring in refractory epilepsy includes craniotomy subdural electrode implantation (grids, strips, depth electrodes) and stereoelectroencephalography (SEEG). Craniotomy subdural electrode implantation is the most common invasive method applied in China. Despite its efficacy and spatial accuracy in mapping the superficial cortex, invasive monitoring using the craniotomy subdural methodology has limitations. Disadvantages may include large craniotomies with a relatively high surgical morbidity, inherent limitations in accessing deep or bilateral cortical structures, and in patients with a negative MRI, electroclinical features suggestive of functional network involvement . As a complementary method for invasive monitoring, SEEG methodology overcome these relative limitations of the craniotomy subdural electrode implantation, and was applied in a highly selected group of patients who were not considered optimal candidates for subdural electrode placement. As to the suspicious EZ, SEEG not only can monitor epilepsy discharging but can also monitor the propagation of seizures within a functional network, especially to the deep cerebral areas in 3D. According to our previous experiences, the criteria for all intracranial electrode implantation are as follows: 1) focal epilepsy; 2) the location of EZ is not clear; 3) the dissection relationship between EZ and functional cortex is not clear. In addition, one of the following criteria are required for SEEG implantation: 1) the possibility of a deep-seated or difficult-to-cover location of the EZ with subdural electrodes in areas such as posterior orbitofrontal cortex, gyrus cinguli, interhemispheric regions, depths of sulci; 2) failed surgery history (including previous failure of epilepsy surgery or failure of a previous subdural invasive study to clearly outline the exact location of the seizure onset zone. ); 3) necessity for bilateral monitoring; 4) MRI negative. In the present study of 40 patients, the MRI in 4 patients was negative (10%). A higher percentage had been reported that 28 patients were with MRI negative in 100 patients underwent SEEG implantation in Cleveland Epilepsy Center . Compared with craniotomy subdural electrode implantation, SEEG methodology would cause a less surgical trauma and be more likely a kind of reversible method in case of EZ unidentified. In our series, 6 patients had cerebral surgery history (5 with epilepsy surgery and 1 with brain trauma surgery). Serious adhesion between dural (if still present) and cerebral structure occurred in most patients with cerebral surgery histories, and therefore, these patients were not suitable for craniotomy subdural electrode implantation. 11 patients underwent bilateral implantation and all other patients were suspected with deep-seated or difficult to cover region(s). Scalp infection and skull defects in the implantation area are forbidden to undergo SEEG implantation. In addition, the implantation surgery should be stopped when the MRI shows that blood vessels of the planning implantation area impede the implantation and the implantation track cannot be adjusted. In the present cohort, 39 patients finished the implantation and SEEG smoothly, 1 patient with intracranial hematoma during the implantation the operation discontinued. 37 of 39 patients with successful implantation showed explicit EZ. Hence, the detection rate of EZ through the SEEG technique in the present study is 94.9% (37/39), which is similar with other relevant research reports: 100 cases of stereotactic electrode implantation surgery reported by Gonzalez- Martinez with 96% (96/100) detection rate of EZ is ; 211 patients of stereotactic electrode implantation surgery reported by Cossu with 96.7% (204/211) detection rate of EZ . It has been demonstrated that the detection rate of EZ through subdural electrodes implantation is 99.2% . Although the detection rate through subdural electrode implantation seems higher, the resection efficacy based on it is not very good. The rate of seizure-free at the end of 12 months follow-up is 62.3% (33/53) with EZ resection based on the investigation result of subdural electrode implantation . In addition, seizures outcome after surgery in patients with MRI negative has been implicated to be less favourable, with the lowest seizurefree rate of 18% [5,6]. The location of EZ is also considered to influence seizures outcome after surgery, with the outcome of temporal lobe EZ resection much better than that of the other regions of EZ resection [7-9]. However, study from Gonzalez-Martinez indicated that the outcome of EZ resection has no obvious relation with either MRI negative or the EZ location . According to Aileen McGonigal’s research, Forty-three patients out of one hundred (43%) had normal MRI and 57 (57%) had lesional MRI, the detection rates with no difference between these two groups, in 95% (41/43) normal MRI and in 96% (55/57) lesional MRI cases. And the seizure-free rates at 1-2 year follow-up after resections were 55% and 53% respectively, which does not reveal an obvious difference between MRI negative and positive groups . Among the 37 EZ clear patients in the current study, 3 patients had bilateral EZ, and 34 patients had unilateral EZ. 32 unilateral EZ pts underwent EZ resections, the outcome of surgery demonstrated Engel I 27, (84.4%), Engel II 2, Engel III 1, Engel IV 2 respectively at the 6 months follow-up. In the 32 patients that underwent EZ resection, the regions were as follows: frontal lobe 13, temporal lobe 10, insular lobe 3, parietal lobe 2, central area 1 and multiple lobes 3. Surgical locations mainly focused on forehead and temporal lobe and no obvious difference of surgical outcome indicted between them. The outcome of surgery in our center was much better than that of other reports, and the reason may be as follow: 1) fewer patients with MRI negative, 2 of 4 cases were Engel I; 2) follow-up visit period was relatively short (for 6 months); 3) more than once implantation. 2 cases in the current study underwent a second implantation due to the first implantation failed finding out the origin of epilepsy discharging. The origin was clarified at the second time and the outcome of surgery was Engel I. The complication rate is 5.0% (2/39) in the current study. The rate of intracranial hematoma (IH) was 2.5% (11/40). Total 489 electrodes were implanted in this study; therefore, the rate of IH per electrode was 0.2%. Scalp infection occurred in 1 patient and rate of scalp infection is 2.6% (1/39). The infection was recovered with conservative treatment. No cerebrospinal fluid leak, electrodes fracture or patient death occurred. 3 cases occurred intracranial hematoma in 100 cases underwent SEEG implantation had been reported by Gonzalez-Martinez at Cleveland Center. The IH rate is 3% and IH rate per electrode is 0.2%. The 3 cases were all recovered with conservative treatment after 2 weeks (2). Another study in 200 cases underwent SEEG implantation demonstrated that the IH occurred in 2 (1%) patients (3). Intracranial hematoma is a common complication of stereotactic electrode implantation [3,11-13]. According the reports of subdural electrode implantation, the rate of complication was 0-26% [14-16]. The main complications were hematoma and infection. A study of 112 patients underwent intracranial subdual electrode implantation revealed that post-surgery brain abscess occurred in 2 cases, and subdural hematoma occurred in I case. Other complications included cerebrospinal fluid leak and transient gastrointestinal reaction such as emesis . Van Gompel reported 198 encephalic electrode implantations with 5 infection cases (infection rate 2.5%) and 6 hematoma cases (hematoma rate 3.0%) . Fountas and Smith reported 185 cases with 5 hematoma cases (2.7%), 2 infection cases (1.1%) and 2 transient aphasia cases . Stereotactic electrode implantation is a deep operation, therefore, the permanent rate of complication was supposed to be higher than subdural electrode implantation . The period of follow-up in the current study is not long enough to reach the similar conclusion. However, according to our research and analysis, we believe that the rate of complication stereotactic electrode implantation is lower than subdural implantation. In addition, the surgical operations and the location of electrode (subdural cortex surface vs cortex to deep brain structure) of these two kinds implantation are fundamentally different. The indications of the two kinds of electrode implantations are different, and in some aspects, they are complementary to each other. Stereotactic electrode implantation is a safe invasive procesure with high detection rates for epilepsy. It is also a beneficially complementary to subdural electrode implantation. ROSA navigated stereotactic electrode implantation, a novel method for implementation of frameless SEEG in epilepsy surgery, makes the operation easier, which could provide a great help for EZ localization and resection. This work was supported by the grant from the Beijing Municipal Commission of Science and Technology (Z131107002213012). Rosenow F, Luders H. Presurgical evaluation of epilepsy. Brain e:124, 1683-1700 (2001). Gonzalez-Martinez J, Bulacio J, Alexopoulos A, et al. Stereoelectroencephalography in the "difficult to localize" refractory focal epilepsy: early experience from a North American epilepsy center. Epilepsia e:54, 323-330 (2013). Cossu M, Cardinale F, Castana L, et al. Stereoelectroencephalography in the presurgical evaluation of focal epilepsy: a retrospective analysis of 215 procedures. Neurosurgery e:57, 706-718 (2005). Wellmer J, von der Groeben F, Klarmann U, et al. Risks and benefits of invasive epilepsy surgery workup with implanted subdural and depth electrodes. Epilepsia e:53, 1322-1332 (2012). Scott CA, Fish DR, Smith SJ, et al. Presurgical evaluation of patients with epilepsy and normal MRI: role of scalp video-EEG telemetry. J. Neurol. Neurosurg. Psychiatry e:1, 66;69-71 (1999). Chapman K, Wyllie E, Najm I, et al. Seizure outcome after epilepsy surgery in patients with normal preoperative MRI. J. Neurol. Neurosurg. Psychiatry e:76; 710-713 (2005). Talairach J, Tournoux P, Musolino A, et al. Stereotaxic exploration in frontal epilepsy. Adv. Neurol e:57, 651-688 (1992). Rasmussen T. Tailoring of cortical excisions for frontal lobe epilepsy. Can. J. Neurol. Sci e:18, 606-610 (1991). Williamson PD, Jobst BC. Frontal lobe epilepsy. Adv. Neurol e:84, 215-242 (2000). McGonigal A, Bartolomei F, Regis J, et al. Stereoelectroencephalography in presurgical assessment of MRI-negative epilepsy. Brain e:130, 3169-3183 (2007). Bancaud J, Angelergues R, Bernouilli C, et al. Functional stereotaxic exploration (SEEG) of epilepsy. Electroencephalogr. Clin. Neurophysiol e:28, 85-86 (1970). Guenot M, Isnard J, Ryvlin P, et al. Neurophysiological monitoring for epilepsy surgery: the Talairach SEEG method. StereoElectroEncephaloGraphy. Indications, results, complications and therapeutic applications in a series of 100 consecutive cases. Stereotact. Funct. Neurosurg e:77, 29-32 (2001). Hamer HM, Morris HH, Mascha EJ, et al. Complications of invasive video-EEG monitoring with subdural grid electrodes. Neurology e:58, 97-103 (2002). Burneo JG, Steven DA, McLachlan RS, et al. Morbidity associated with the use of intracranial electrodes for epilepsy surgery. Can. J. Neurol. Sci e:33, 223-227 (2006). Wong CH, Birkett J, Byth K, et al. Risk factors for complications during intracranial electrode recording in presurgical evaluation of drug resistant partial epilepsy. Acta. Neurochir (Wien) e:151, 37-50 (2009) . Najm IM, Bingaman WE, Luders HO. The use of subdural grids in the management of focal malformations due to abnormal cortical development. Neurosurg. Clin. N. Am e:13, 87-92 (2002). Yang A, Meng F, Zhenag J, et al. Evaluation of implantation of intracr anial electrodes for epilepsy surgery. Chin. J. Neurosurg 26(1), 1013-1016 (2010). Van Gompel JJ, Worrell GA, Bell ML, et al. Intracranial electroencephalography with subdural grid electrodes: techniques, complications, and outcomes. Neurosurg e:63, 498-505 (2008). Fountas KN, Smith JR. Subdural electrode-associated complications: a 20-year experience. Stereotact. Funct. Neurosurg e:85, 264-272 (2007). Rydenhag B, Silander HC. Complications of epilepsy surgery after 654 procedures in Sweden, September 1990-1995: a multicenter study based on the Swedish National Epilepsy Surgery Register. Neurosurg e:49, 56-7 (2001).